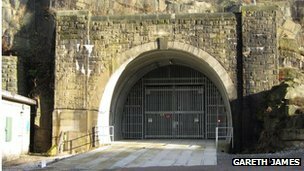 Two Victorian rail tunnels in the Pennines are not to be reopened. 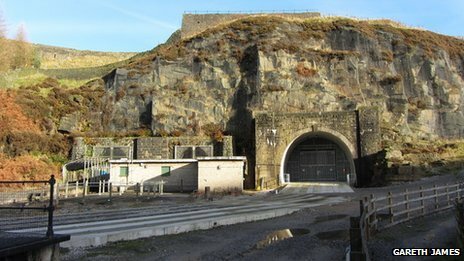 Transport Minister Stephen Hammond made the decision not to buy the Woodhead tunnels, between South Yorkshire and Derbyshire, from owners National Grid. The tunnels formed a section of the old Woodhead Line, which was closed in 1981. Mr Hammond said alternative schemes such as the Hope Valley route could accommodate the predicted growth in rail travel between Manchester and Sheffield. He said his decision did not rule out the possibility of reopening the Woodhead route to rail traffic in future. But, if an additional rail route was ever required on the route, the best solution was most likely to be the construction of a new tunnel, Mr Hammond said. National Grid bought the three-mile (4.8km) tunnels in the 1960s and installed high voltage cables to transmit electricity. In 1981 National Grid also purchased the modern tunnel to install new cables, planning to abandon the Victorian tunnels when the cables needed renewing. National Grid began work on this project in 2007 and it is close to completion. Campaigners had been hoping to reopen the line and improve transport links between Manchester and Sheffield. A batch of six new ADL E20D Enviro200 single-deck buses has been delivered to Chesterfield recently (36985-91), and the first couple made their way onto town routes 5 and 39 on the 12th November. These have in turn replaced a number of older Dennis Darts. A selection of images from Colin Sellers can be found here along with an odd running of a Dennis Trident on the normally single-deck route 5.